Damp houses, cold children living in fear, with communities struggling to respond to the challenges of deprivation and a lack of resources while the state fails to act. These were just some of the findings of three reports published in the last week. The three studies demonstrated not just the reality of poverty and deprivation for thousands of Irish families and the communities they live in, but also the appalling gaps in how effective government policy is in dealing with the economically marginalised in Irish society. The How are our Kids? survey is one of the first ever studies of child-related issues in Ireland and covers the communities of Dublin's West Tallaght area. The survey found that nine out of ten children experience fear of anti-social behaviour or crime and that more than one in four live in cold, damp houses. The report also found huge inequalities in the provision of education, with 27% of children leaving school with no qualifications, while 34% finished at Junior Cert level. The second study, Housing Problems and Irish Children, was conducted by Simon Brooke of Trinity College's Children's Research Centre and uses data from the census, the Quarterly National Household Survey, other CSO data and Dublin City Council's tenant profile. The Trinity study found that in 2002, over 50,000 Irish children lived in overcrowded, rundown and damp housing, double the number in this position in 1991. 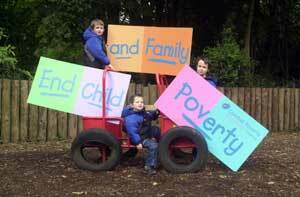 Another first was the Vincentian Partnership for Social Justice's Family Budget Survey. They costed 700 goods and services to estimate the true cost of running a home. They found substantial gaps between the level of social welfare payments and the actual minimum cost of running a home in Ireland today. The costs included only covered basic needs and didn't allow for any spending on alcohol, tobacco, household pets, savings, insurance or unexpected illness. An Phoblacht spoke to Seán Crowe, Sinn Féin TD for Dublin and spokesperson on social and family affairs, about the West Tallaght report and the other surveys. The Tallaght communities make up a substantial part of his constituency and early this week he was at a public meeting attended by over 200 people that launched the report. Crowe said that people accept the findings but are rightfully angry at the labelling of the area. "Communities have got on with their lives and have adapted to their economic reality, despite the infrastructural deficits in the area", said Crowe. Examples of this include organising community meetings with Dublin Bus and the Gardaí that led to a reduction in the number of attacks on local bus services. Then there was the massive community response to tackle drug related problems in the area, as well as the work of estate management groups. Activities like these highlight, according to Crowe, the central and local Government failures in the area. He said that local people had highlighted the policy of local authorities using West Tallaght in the past as a dumping ground for problem households and it was this that prompted communities to form estate management groups, because the council were "not doing their work". Then there was the simple act of phoning the local police station, which was not possible in Tallaght because local people can't through because of dilapidated equipment. Most important, according to Crowe, is the need to learn and move on from this report. "There are many other Tallaght Wests, and is it too much to expect that in a time of plenty there would be greater resources to tackle inequality? "We are sick of short-term solutions. We need a long-term strategy of investment. We need a template. It's not rocket science and society can respond by investing the resources now." Crowe proposes, in the context of the How Are Our Kids? Report, the need for breakfast clubs for schoolchildren as well as homework clubs, more funds for the Breaking the Cycle initiative, as well as smaller classrooms for children from disadvantaged areas. One incredible example of the current lack of funding and state inefficiencies is a local playground that is closed for two days a week as there is not enough matching funding to hire playground supervisors. It is, according to Crowe, "like waving lollipops over children's heads". Addressing the Vincentian Partnership study into the standard of living, Crowe said that this study should be used by new Finance minister Brian Cowen as a clear case for increased social welfare payments in the coming budget. "Minister Cowen has a clear transparent study of the real costs of living in Ireland today," said Crowe. "This study looks at the barest minimum cost of day to day living and the costs involved are substantially above the welfare payments provided by the government safety net." Another budget without the needed investment in Ireland's economically marginalised and deprived communities in the aftermath of these reports will prove conclusively that the new cabinet is on the same track as the old one of not caring about Ireland's underprivileged communities. 34% - Proportion of children who finished at Junior Cert level. Provision of adequate heating in all houses. Provision of extra-curricular opportunities for children. A "fresh start" approach to help parents living in a stressful environment.